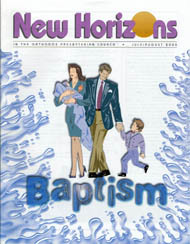 God communicates his love to us through the means of grace (the Word, the sacraments, and prayer)especially, as I argued in the May 2000 issue of New Horizons, in the preaching of the Word. While preaching may be primary among the means of grace, the Holy Spirit (who makes effectual the means of grace) also uses the sacraments (holy baptism and holy communion, or the Lord's Supper) to convey the love and grace of God to us. As with preaching, the content of baptism and the Lord's Supper is the gospelthe blessings and benefits that are ours because of the person and work of Christ. Precisely the same thing, then, is communicated to us in the sacraments as in the preaching of the gospel. You have finally gotten your Baptist friends to join you for worship. “Now they will hear a good Reformed sermon and experience real biblical worship conformed to the regulative principle!” you say to yourself. Many evangelical, Bible-believing Christians believe that baptism should be reserved for those who make a profession of faith. They point to the clear teaching in the Bible that converts should be baptized (see, for example, Matt. 28:19; Acts 2:37-38; 8:12; 18:8). The baptism warranted in the Bible by precept and example, they say, is believers' baptism.